Santander - The port city of Santander is the capital of the autonomous community of Cantabria situated on the north coast of Spain between Asturias (to the west) and the Basque Country (to the east). Santander is a city that lives facing the sea, in the wide bay of the same name. While the environs have become industrialized, the city center is still the ideal zone to go for a walk along the sport harbours, nice beaches and colourful parks. Santander is situated on the north coast of Spain, around 250 miles from Madrid. This elegant city, capital of the Cantabria region, was a popular resort with the aristocracy from the mid-nineteenth century onwards. Although a huge fire ravaged Santander in 1941, which destroyed much of the old quarter, the city was later rebuilt along its original lines. Today Santander is a fashionable town with a pretty waterfront promenade, wide boulevards and many hotels and restaurants. There are also some enjoyable coastal walks on the edge of the city. Santander's fortress-like cathedral was badly damaged by the 1941 fire, although it has now been fully restored. Inside is the tomb of writer and historian Marcelino Menendez y Pelayo, who was born in the city in 1856. The cathedral is also notable for its Gothic cloister and 12th century crypt. In 1983 Roman ruins were found underneath the main aisle. For an insight into the area's prehistoric origins, the Museo de Prehistoria y Archaeologia houses some interesting artifacts discovered within the province. Highlights include several finds from the prehistoric caves at Altamira, as well as some Roman pieces from local hill forts. The Museo de Bellas Artes is home to an interesting collection of paintings by Francisco de Goya, including a series of etchings entitled 'Disasters of War', and a fine portrait of Fernando VII. Founded in 1907, the museum also contains works by Flemish, Italian and local Cantabrian artists. Santander has many fine beaches, most of which are clean and well maintained. One of the most popular, Playa del Sardinero, is situated a couple of kilometres from the city centre in the elegant suburb of El Sardinero. 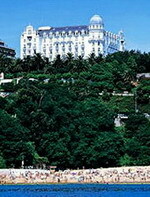 Alongside the beach, which is one of the least polluted in Europe, is a promenade lined with various hotels, restaurants and 19th century mansions. The Magdalenas peninsular, located to the south of El Sardinero, has a number of attractions including the Palacio de la Magdelena. Built in 1911 as a summer residence for King Alfonso XIII, this English-style palace hosts the city's music and theatre festival in July and August. The Magdalenas peninsular is also home to a small zoo, which contains various animals including seals, polar bears and penguins. The small Blue Flag beach of El Camello is located nearby. To the north of El Sardinero, situated within the Cabo Menor, is the large open space of Matalenas Park. Here you will find a lighthouse, another small zoo, and the local golf course. There are some beautiful coastal walks along the cliff top. If you want to get completely away from the city for a while, take a 15-minute boat trip to the beach at El Puntal, known for its spectacular sand dunes. There are flights from Madrid, Barcelona, Dublin and London Stansted to Santander's international airport, around 4 miles (6km) from the city centre. A regular bus service runs between the airport and Santander train station. The city is also an important port, with Brittany Ferries running a regular service to Santander from Plymouth in the UK. 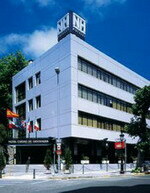 About the Author - For more advice and tourist information about Santander please see Santander Spain. Located in Santander, near Sardinero beaches, and Mataleñas golf course. A privileged location for your celebrations, meetings, wedding, and business. We look after the smallest detail to give you the perfect welcome and make your stay as enjoyable as possible. We provide a wide offering of haute cuisine and meticulous service. Offering High Speed Wireless Internet Access (WiFi) to All Guest Rooms and Common Areas. Its privileged setting is an ideal place for you to enjoy your time away to the full. Our cafeteria and landscaped terrace are the ideal meeting point and one of the most pleasant places for peaceful enjoyment of the atmosphere of El Sardinero. 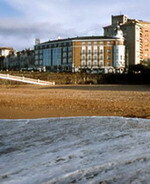 The Hotel Real is a beachfront hotel located in Santander, Spain, 300 metres from the Magdalena Palace. Situated on a hill overlooking the bay of Santander, this hotel is built in a neo-French style and is surrounded by gardens. Hotel Real features a lobby with television, bar and spa services at the Thalassotherapy centre. The El Puntal restaurant, decorated in bright colours with a stained glass window feature, is open for meals daily and offers regional and continental dishes. Guests can relax with a drink in Bar Theros. The Thalassotherapy centre is a luxury health spa located on three floors of the hotel. Air-conditioned guestrooms at the Hotel Real feature sleek marble bathrooms and restored original 19th century neo-French features. Located 50 metres from the beaches of Sardinero, this high-rise hotel is set amongst lush plant-life beside the Bay of Santander. Those wishing to explore the city will find that Santander features many historical buildings, such as neoclassical monuments and the Gothic cathedral, which is three kilometres from the hotel. The Pre-historic and Archeological Museum is within two kilometres of the hotel and the Museo de Bellos Artes is a three-kilometre bus ride. 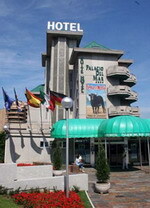 The hotel's range of amenities includes a restaurant, cafeteria, parking, shopping centre, children's area, and discotheque. All 350 guestrooms feature decor of floral drapes and soft colours, and all rooms come with cable television, minibars, safes, and fully-fitted marble bathrooms with complimentary toiletries. Conveniently located in the shopping and service district, close to the popular Puertochico and 1,000m from the Sardinero beach. To break from the static menu idea, on our premises we propose a menu of the day that aside from the quality, is original and different with a wide selection of dishes that we conform to. Amongst the daily starters there are two salads (fresh cheese with anchovies or seafood salad); a rice dish; a vegetable dish, green beans sautéed with ham; a legume dish, white beans with chorizo sausage; and a pasta dish, garlic spaghetti with shrimp. Three meat and fish choices complete the menu. In addition, on the weekends we offer a provocative sampling menu and pre-order only rice dishes. 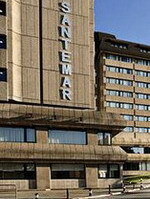 The Hotel Palacio del Mar is located in Santander, Spain, 200 metres from the Municipal de Exposiciones exhibition centre and 250 metres from the El Sardinero beach. Situated in a quiet residential area, Hotel Palacio del Mar is set in a modern, five-storey building featuring spacious areas with natural light. A piano bar and a pub offer live music in the evenings. Complimentary use of the Valdesport Centre is offered, including use of the indoor swimming pool, fitness centre, sauna, and Turkish bath. 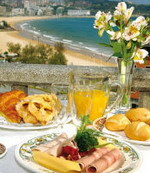 A buffet breakfast is served each morning at the hotel and a coffee shop is open throughout the day. Restaurant Neptuno specialises in seafood dishes and opens for lunch and dinner. All 67 guestrooms are air-conditioned and soundproofed, and are decorated in a modern style. 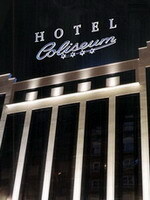 The Hotel Silken Coliseum is contemporary design hotel with imposing façade located in the centre of Santander on the north coast of Spain, 500 metres from the beach. Art lovers can visit the fine art gallery 350 metres from the hotel, while those with an appreciation for nature can take a trip to Cabárceno Wildlife Park, 10 kilometres away. La Platea restaurant is open daily for lunch and dinner and diners can sample traditional Cantabrian dishes from a daily menu or a la carte options. Guests can relax in café 'Bambalinas', open until late, and enjoy hot and cold drinks with a pastry or light snack. Room service is also provided for in-room refreshment. There are 92 guestrooms in total, all of which are characterised by decor in simple, neutral tones and contemporary furnishings. 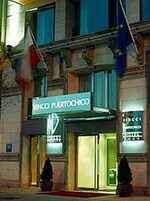 The beachfront Hotel Silken Rio Santander is housed in a traditionally styled property with a glass turret, and is located in the lively and historic Spanish city of Santander. Santander Cathedral is 2.5 kilometres from the hotel, as is the Museum of Fine Arts. The hotel houses a lounge bar offering a wide range of international drinks, and there is a business centre and meeting facilities. Restaurant La Cupula serves regional specialities, such as Ragout of Milk-fed Lamb Sweetbreads with fresh Artichokes, and Loin of Rabbit with Picón Cheese Sauce, in a contemporary setting with sea views. The 89 guestrooms, over five floors, have light, neutral decor, contemporary furnishings and fitted carpets. The Vincci Puerto Chico is a modern seven-storey hotel with a glass and brick façade set on the Santander bay, offering views across the adjacent marina, located 500 metres from the Festival Palace. After breakfast, guests can browse through the complimentary newspapers in the lobby and ask the concierge for sightseeing assistance. Guests can relax with a drink in the café or cocktail bar, or sunbathe on the terrace overlooking the bay. There is also a contemporary hotel restaurant, Mirador, which serves an à la carte selection of regional and international dishes. Other hotel amenities include a gift shop, nearby parking, and 24-hours room service. The 51 air conditioned guestrooms are decorated in soft blues and beiges with wooden floors, blue fabrics and contemporary furnishings.